Woah. No matter how much people tell you about a place before you go, nothing can prepare for smell. That was the first thing that hit me, along with the noise of the Khao San Road. After a smooth flight with a nifty entertainment system (watched Ghostown and Wanted on my screen we checked into Thailand with no problems. We took a brief taxi ride to Khao San to get to our accomodation and saw for the first time to cloud of smog that covers the city. We've barely been here two full days and already it feels like we have taken a crash course in learning how to survive in Thailand. Top tip: trust no one! That is what has struck me, everyone is here to make a quick buck. Even the 6 year old girl who I really should be beating in a thumb war - cost of the loss = 50p. Yesterday we took a long boat around the old parts of Bangkok, watching people floating about their daily lives, transporting their food and essentials to their houses on stilts. 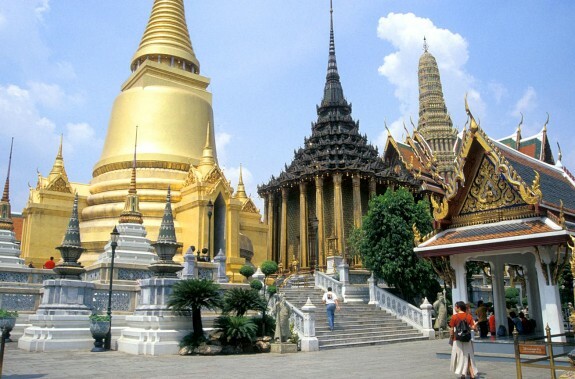 We want to see the Grand Palace etc but have decided to do that on our way out of Bangkok in a few weeks time. Today we are heading south, with the ultimate aim of arriving in Phuket in the next couple of days. We are stopping off in Hua Hin tonight so expect to see photos of us on the beach soon!